You may wonder why someone from Dundee could have been involved with the Auchengeich Colliery Disaster in 1959. Bedlay Colliery as a Mine Driver. I was also a Part-Time Rescue Brigadesman for Bedlay Colliery attached to the Coatbridge Rescue Station; I had been trained some years earlier by Jimmy Simpson, J. Brown and J. O’Neil the three Instructors at that time in Coatbridge Rescue Station. The Superintendant was W. Dyer and The Assistant Superintend was W. Townsley. 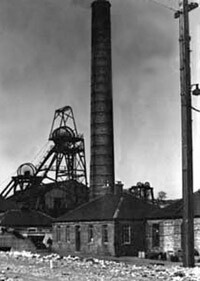 My first experience of Mining Disasters was the Kames Explosion in 1957, my final one in Scotland had been the Michael Disaster in Fife in 1967 before I moved to Winscales Mine and Fire Rescue Station in Workington, Cumberland as Assistant Superintendent. In 1970 I left the NCB and took up employment with the Michelin Tyre Company in Dundee as a Shift Manager until I retired in 1993. On that fateful morning I had arrived home from the Bedlay colliery after my night-shift and after something to eat had gone to bed, later to be wakened and informed that there was an incident at the Geich colliery, (we all knew it as Auchengeich,) would I make myself available if so there was Coal Board Van coming to collect me. 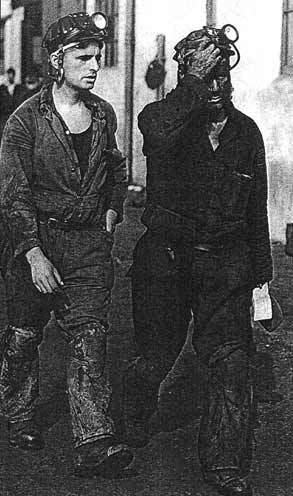 I arrived at the colliery sometime around 10:30am and reported to the building where the Mines Rescue workers were standing about. I was informed I would have to make myself ready to go underground, that meant getting dressed in working clothes and picking up a Breathing Apparatus. I was part of the Cardowan Team made up of: Jocky Henderson, John Peattie, (Jim Eadie a member of our team, but not present at that time in the team) myself and Jim Armour. Further Brigades men A. Mann and A. Gibson were in the group to go underground. While wearing breathing apparatus we had to sample the air and take temperature readings in the return airway, we remained there for quite sometime no-one was to go any further than that locality. Except on one occasion when sampling in-bye we heard the haulage bell ring, this was reported to the surface management team, who asked for us to go in-bye as far as the haulage engine, when in-bye J Peattie tried the bell, but there was no response. Jocky Henderson, Jim Armour, A Gibson also assisting in turns at taking samples had also to go in-bye at various times to investigate some other bell ringing in the upcast shaft pit bottom. We were relieved by another team and we returned to the surface around 5:00 pm. Having recharged our apparatus we were then informed that all men were being withdrawn from the pit and the area was to be flooded to seal off the fire. Knowledge on how long this would take was uncertain, but we were to go home and make ourselves available for when we would be required. W. Adams: Fulltime Brigadesman Captain. W. McAlpine: Fulltime Brigadesman Vice Captain. J. Peattie: Part-time Brigadesman and myself. There would be a further team covering us, positioned at the Fresh Air Base, while we were in-bye. What goes through your mind in situations like this, it is hard to think about, but I knew three men intimately who were lost. John Mulholland lived with his family on the same street as me. Pat Harvey’s family who had lived at 8 Dalshannon Place, our family lived at 9 Dalshannon Place years earlier before my family moved to Dalshannon Road around 1951, and John Stark, John and I met at the Mining School in Falkirk where we both studied Mining, John loved to play the accordion. Every lunch time after we had had our sandwiches he would have us go to the Music Shop where he asked to try out the accordion that he wanted to buy, from memory, I’m sure it was a red sparkled box. He spoke of his girl-friend in our conversations her being Margaret Cairns. I moved on and gradually lost contact with John, but that morning they were all in my mind, would we as a team find them. W Adams went through the Captains duties of checking all our apparatuses and we moved off from the (FAB.) The atmosphere had a slight haze and our lights penetrated the atmosphere like you find with fog. We turned into the main haulage roadway and advanced towards the lost man riding train seconds later we were getting reflections in the distance from the reflectors either the lamp on the bogey or the men’s own pit lamps. We were now standing in front of the train, all the men were sitting there as if they had all fallen asleep no injuries slightly slumped against each other arms hanging loosely down by their sides or lying forward or backwards against each other in their seats. They were sitting there two by two facing towards each other. We had come around 200 yards, hard to believe that they were so near to safety and couldn’t get there; this indicated that death had occurred before the man riding train had come to a halt otherwise there would surely have been some attempting to get off the train or they had fallen asleep waiting on the train to move forward. We proceeded forward and located a further man face downwards on the left side of the road and further forward again on the left side of the road another man slumped on his hands and knees lying against the side of the road, further forward we came on a roof fall blocking the road, we could go no farther. Temperature readings were taken and we returned to the FAB where W Adams made his report to those in charge. Everyone returned to the surface where we prepared our apparatuses for what had now to be done, recover the men. All the Rescue Brigades men were called together and a list of teams was read out. Teams of four would in turn proceed underground and attempt the recovery, it was thought three or four journeys for each team to recover a man, each time place him on a stretcher, cover him with brattice cloth and bring him to the FAB. A numbered steel pin tag was to be placed on the seat or the place where we found each man and a similar numbered tag to be pinned to his clothes. Stretcher bearers would take over from the FAB and proceed to the surface with the stretcher. There were explosives and detonators carried by the men on the train, we were to remove them to a save situation as we found them amongst the men. The task was started it was hoped to get the job done before daylight and before the public knew of it for everyone’s sake. Our team: Eric Savage, Charles Sharkey, Eddie McAtee and Jim Eadie made two trips during the night recovering three men on each exercise eventually all the men from this side of the roof fall were recovered. On each return to the surface we had to recharge our apparatuses so that the work was continuous. A team was formed to get the roof fall cleared this was done and from a further distance, in-bye, the last man was recovered. The mines Inspectorate and Management wanted to look at the position of the conditions in the South Ball Coal area return airway. Around 11 o’clock am. I along with C Seaman, Part-time Brigadesman, and the management group went underground to inspect this location, having done this job we all returned to the surface. We were informed that all men were being returned to the surface and transport would be made available to transport us home, I arrived home sometime on the afternoon of the Monday to sleep and get ready for my night shift in Bedlay. Les Adams wanted to get in touch with family members from Coatbridge Mines Rescue Station My father John Armour worked there from the late 40s till his retirement in 1971 - he in fact saved Les from drowning when he was very small in the canal next to the Station. Hi there are so many names on your Site I recognise from my childhood. My name is Les Adams and I spent my childhood at Coatbridge Mines Rescue Station where my father William Adams was first an instructor then assistant superintendent. We moved to Kilmarnock station in 1965 when my dad was made superintendent. Names like Eric Savage, Charlie Sharkey, Bill Townsly, Willie Mc Alpine and Jimmy Homes. I hope you can put me in touch with anyone who still remembers the old days with the fondness I do. I was pleased to read your contribution to the Auchengeich site as I was very much involved on the 18th Sept. I started to do mines rescue training at Coatbridge in 1961 but did very little as I was on a DPT course and a fire started at Wester Auchengeich and I spent all my time washing apparatus. I eventually completed my training at Cowdenbeath when I moved to Alloa and we set up a Specialist team along with the mines inspectorate, I completed 17years. Most of the names in your excellent report brought back memories as I also worked at Cardowan, Wester Auchengeich and Auchengeich. Adam Gibson was my Deputy when I was an Oversman and I got many tales re-Machrinach fires. John Peattie took me every week to Coatbridge Mining College in the car he bought with rescue money. I am in touch with Frank Gibb and hope to visit him shortly. I still stay in Alloa and see a few of the ex-mines rescue part timers. Fionn can give you my e-mail address if required.